Interested participants are welcome to come to the museum to have local appraiser Mark Lawson and a team of certified gemologists appraise the market value of jewelries. Appraisals will be $5 per piece with a limit of three per person. Appraisals will be verbal appraisals. Mark Lawson Antiques is a major sponsor of the Albany Institute’s current exhibition Bejeweled and Bedazzled: Jewelry and Personal Adornment. More than one hundred works of jewelry and personal adornment dating across four centuries sparkle and shine in the exhibition Bejeweled and Bedazzled: Jewelry and Personal Adornment. Drawn from the collections of the Albany Institute and private collections, these personal effects tell stories about the individuals who owned them, where and why they were purchased, and what they reveal as works of art and embellishment. Throughout the exhibition, paintings, prints, and photographs as well as other rare materials drawn from the Institute’s collections broaden our investigation into these small but precious items. Bejeweled and Bedazzled is the first exhibition to focus exclusively on the Institute’s collection of jewelry and objects of personal adornment. Admission rates are $10 for adults, $8 for seniors and students with ID, $6 for children aged 6-12, and free for children under 6. Albany Institute members are admitted for free. There is no charge to visit the café or museum shop. For more information, click here or call (518) 463-4478. 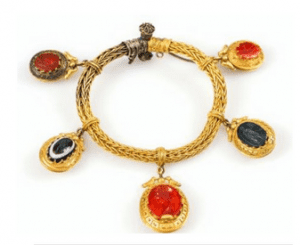 Photo of Hardstone Intaglio Bracelet, unidentified maker, probably Italy, c. 1860–1870, gold, hardstones, brass, provided by Albany Institute of History & Art.